If you have any queries please don't hesitate to get in touch. However, before contacting us you may want to take look through our frequently asked questions just in case we've already answered your query. Click on a question below to open the corresponding answer. Osteopaths are able to help with a variety of conditions including neck or back pain, joint or muscular pain, sports injuries, recurring headaches and more. For a full list please view the Treatments page. The first appointment including a full medical case history, examination and treatment is £50. Each follow up appointment is £40 and these are only booked as and when required. For children aged 5-13 years, the first appointment is £40 and each follow up appointment is £35. The first appointment is typically 45-60 minutes and the follow up appointments 30-45 minutes, athough duration is dependent on the nature of your condition. Click here to find out what happens at the first treatment. How safe is treatment and are there any risks? Treatment is gentle and safe. However, all medical intervention carries a risk, these risks will be discussed with you and your consent obtained before treatment. You will be fully screened before treatment and only approved techniques will be used. Like the old cliche goes, "we spent 5 years being trained what not to do as well as what to do". No, osteopaths are fully trained to identify the signs and symptoms of serious medical dysfunction. They are trained to establish when it is safe to treat and when it is not safe to treat. They may refer you to your GP or another healthcare professional for further investigation or treatment if necessary. You will be able to see James quickly. What do I need to wear? Do I need to bring anything with me? Osteopaths need to be able to observe how your body moves by seeing how joints, muscles and skin move. Osteopaths also need to conduct testing to make sure that your nerves are functioning properly and this can involve testing to make sure that your sense of touch is working properly. Some clothing can limit your mobility during treatment. For these reasons it is normal for Osteopaths to ask you to remove some clothing, click here for more information from the Institute of Osteopaths. Sometimes this may involve dressing down to your underwear. James can provide a gown if preferred and you can wear this throughout your appointment. Some patients prefer to wear or bring with them shorts/sports bras or alternative thin tight fitting clothing. Please discuss this with James if you are at all concerned and remember your preferences will always be accommodated. Some patients bring a list of accidents, surgery, illnesses with dates with them. James will ask about any accidents, injuries, illnesses or surgery that you have experienced back into your childhood. Muscles and joints often remain affected for decades after these incidents. Patients often find it difficult to remember the names of their medication and find it easier to bring a list with them. If you have any medical reports or scan/x-ray results then please bring them with you. Do you treat children, babies and pregnant women? Yes, I treat many children and pregnant women. You will need to attend treatment as a chaperone if the patient is 16 years or under. Unfortunately, I do not treat babies under 5 years old. Does treatment hurt? Do you use 'clunks' and 'clicks'? Treatment does not hurt. Osteopathic technique is generally gentle and if you are concerned then we can discuss this and choose techniques that you prefer. James can easily adapt his treatment to avoid 'clunks' and 'clicks' and deep massage. Please discuss this with him. How experienced are you and are you regulated? Osteopaths have to study for five years at university under the guidance of experienced practicing Osteopaths and undertake at least 1000 clinic hours prior to sitting practical registration exams with the governments General Osteopathic Council. 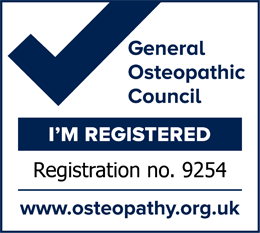 The General Osteopathic Council is similar to the General Medical Council that regulates doctors in the UK. It is against the law to claim to be an Osteopath without being registered. How do I make a complaint about my treatment? James is always available to discuss any problems you are having and will always listen to your concerns about your treatment. It is not about delivering a treatment without regard for your preferences, this is your treatment and you always have a say. Just tell James if there is anything you do not like. If you feel that there has been a problem with your treatment and you are not comfortable discussing this with James, then you can discuss this with the owner of Cleobury Chiropractic, Sue Brown. If this does not resolve the problem or you feel serious misconduct has taken place then you can raise this direct with the General Osteopathic Council. Yes, no problem, some patients prefer to bring someone into the treatment room with them. In fact, all patients 16 years or under must attend with a parent or guardian. Can I discuss my condition with you before my appointment? Yes, I am happy to discuss your condition with you prior to treatment and can confirm whether I can help or not. Can I help myself, will I have to do any exercises? Medical research shows that treatment in combination with exercise and modification of activities is the best way to aid quick recovery. James uses an industry gold standard exercise tool to provide you with exercise programmes tailored to your personal condition, lifestyle and health. As well as demonstrating these exercises to you, you will be provided with an email detailing how to perform the exercises and how many to do. It is of course up to you whether you do these exercises. Some patients like to agree a programme that becomes increasingly more difficult, this can be very rewarding because patients are often surprised by how much more they can do in a relatively short time. Can you help me improve my sporting performance? Treatment can improve your bio-mechanical efficiency by reducing muscle tonicity and optimising joint position. This is great for preventing injury and can improve your performance. I am a qualified ASA swimming teacher and have trained in optimising bike set-up with physiotherapists from the Team Sky and Orica Greenedge cycling teams. I also am an Ironman, ultra-distance runner and endurance cyslist. Always happy to advise on training and racing. Do you treat using 'clunks and clicks'? Yes, when it is appropriate I can treat using techniques that gap joints and create 'clunks and clicks'. However, I can easily avoid these techniques if you prefer. I will always discuss this with you and would never deliberately suddenly create 'clunks or clicks' without warning. What are your treatment hours? Monday-Thursday: 4pm -9pm. Friday: 12:30pm-9pm. In addition, the clinic can be opened between 7am and 9am if you need an early morning treatment.